I have tasted mango salsa from a jar. This is nothing like that. This is so good! It is also my mom's recipe. Peel and dice the mango. Dice the jalapeño, onion and tomato. Slice the green onion thinly. Mix all ingredients well. Serve with fresh fish, tortilla chips, chicken, etc. 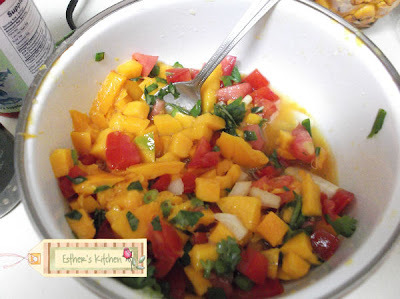 This fruit salsa should also work well with pineapple (which I am going to try next). I know my mom tried with with peaches and she loved the taste.